People love making excuses. 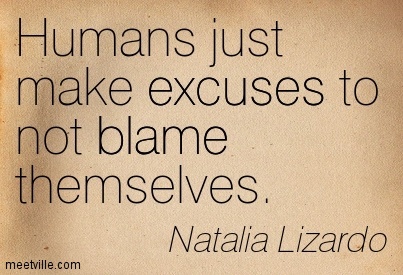 It’s in our nature to come up with excuses. It’s an instinct. A way to protect ourselves. Over the years I’ve used and heard some pretty pathetic excuses and they’re the best. One day you might need a ridiculous excuse for something and this list might be the answer you were looking for. Here are 10 weird excuses to get out of any situation. I accidentally locked myself in my own room. It’s a real disaster. I’m moving because my neighbor took down the trees in his yard, which means there are less shadows protecting the earth from the sun’s heat. My neighbor is pretty much solely responsible for global warming and I don’t need that in my life right now. It’s too dangerous to go outside, because I have dyslexia. My horoscope said I would find the love of my life today if I gave myself some room to meet new people. I’ve been searching all over my room and still haven’t found him. I have to keep looking. The voice in my head is giving a private concert tonight. I have to be there. My computer caught a virus. I’m afraid I might be contagious. Sorry I’m late. I thought I was listening to my GPS, but it turned out to be Beyoncé’s “Irreplaceable”. To the left, to the left/ Everything you own in the box to the left. I kept going in circles. My father’s uncle’s sister’s mother’s daughter’s Guinea pig died. She really needs me right now. My car is not working, so I have to find him a new job. This post is from one year ago but it made my day! Thank you! This lovely post just made my day!